Diphtheria (pronounced "diff-THEER-ee-uh") is an infectious disease caused by a bacterium called Corynebacterium diphtheriae. It can be treated by special drugs, or by antibiotics. There is a vaccine which can prevent diphtheria. In some people, infection with diphtheria-causing bacteria causes only a mild illness. These people may have no obvious signs or symptoms. Infected people who do not know they have diphtheria are called carriers of diphtheria, because they can spread the infection without being sick themselves. A second type of diphtheria can affect the skin. 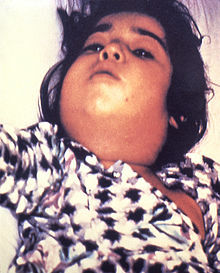 This type of diphtheria is called cutaneous diphtheria. It causes pain, redness, and swelling on the skin, like other bacterial skin infections. People with cutaneous diphtheria may get ulcers, covered by a gray membrane, on their skin. Cutaneous diphtheria is more common in tropical climates. However, cutaneous diphtheria also happens in the United States, especially among people with poor hygiene who live in crowded conditions. This page was last changed on 24 September 2016, at 04:42.